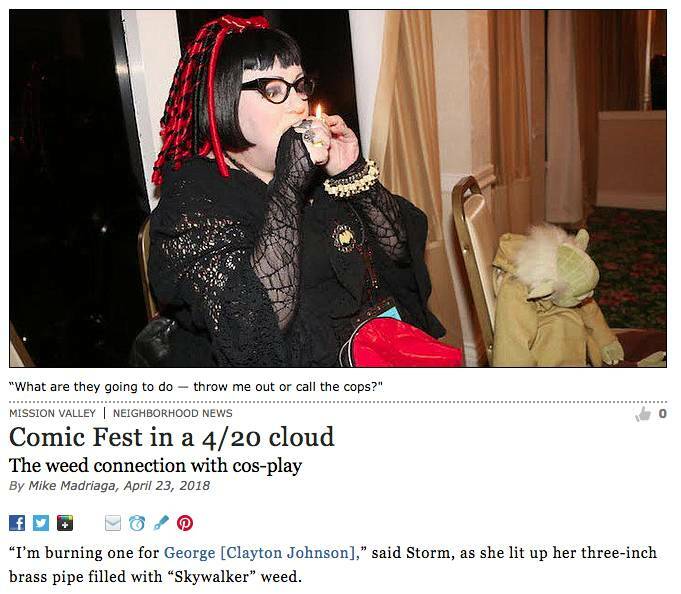 “I’m burning one for George [Clayton Johnson],” said Storm, as she lit up her three-inch brass pipe filled with “Skywalker” weed. 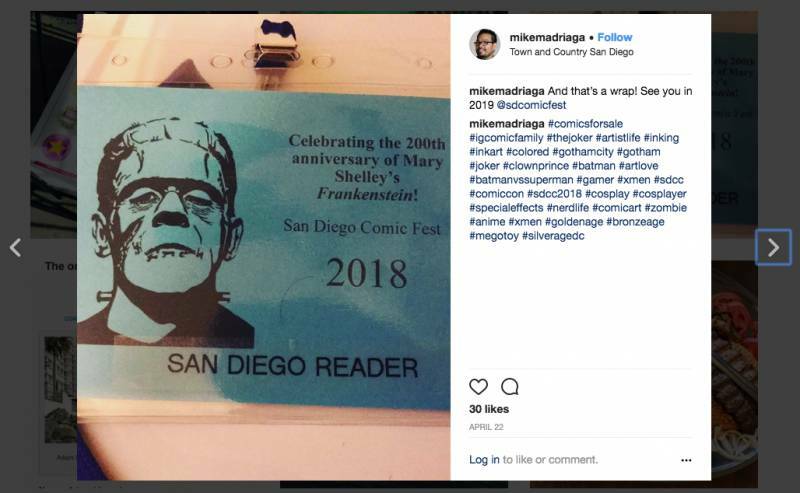 “Oh, snap,” I said, then motioned over to the security guard at the Frankenstein display next to the elevators. Storm snickered and exhaled a big cloud of smoke, simultaneously. At 9 p.m. on April 20th, we were loungin’ on the seventh floor of the Regency Tower that’s located on the northeast section of the Town and Country San Diego resort (about a hundred yards south from the Fashion Valley Mall). 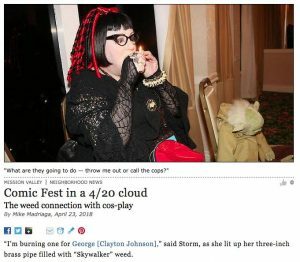 This was the first night of the Sixth Annual San Diego Comic Fest, which also was the 4/20 date to commemorate weed day. “…. 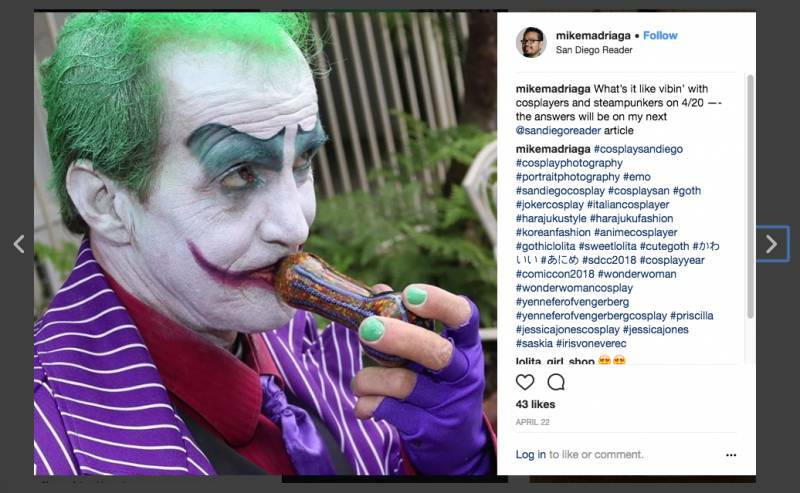 take a hit, Mike?” Storm asked. “Us comic book nerds aren’t any different,” she said. “Aye, aye to that,” I confirmed and lifted an empty plastic cup. 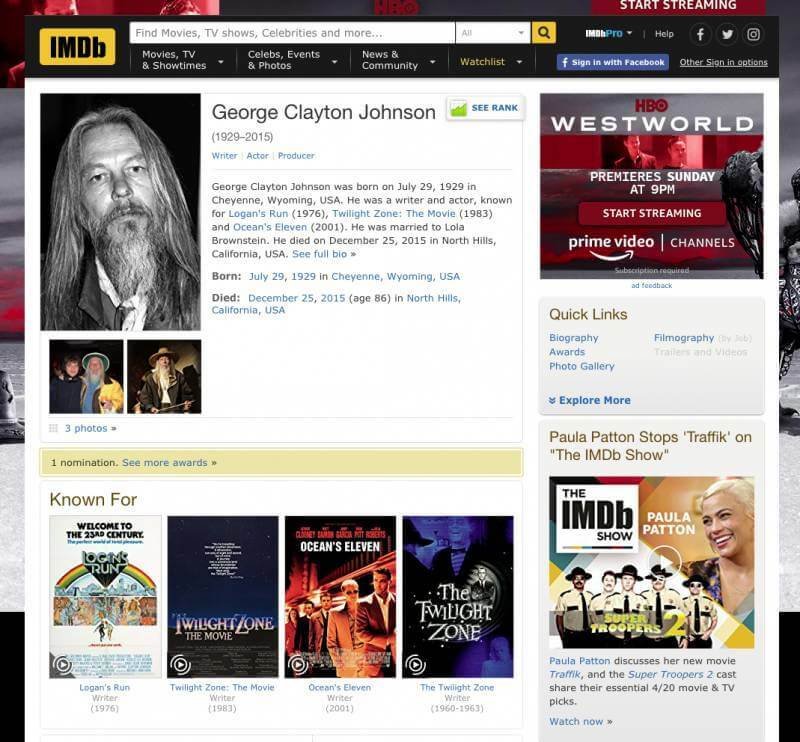 Storm, 50, is a professional costume designer and creator. 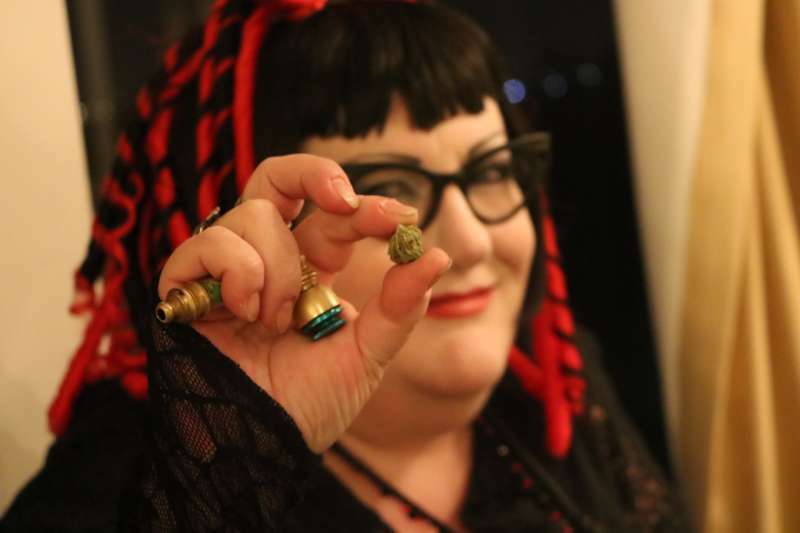 “I’m a cos-business,” she said, “not to be confused with a cosplayer that runs around in an anime-styled outfit that’s giggling all of the time.” She makes costumes for fellow cosplayers, re-enactors, steampunkers, drag queens and burlesque performers — for hundreds of dollars. She usually cosplays as a Klingon, an “extraterrestrial humanoid warrior” species in the Star Trek franchise. Tonight, though, she played it down and wore her goth ensemble with red hair extensions and vintage cat-eye glasses. 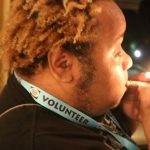 “I’ve been smoking weed for my migraines and anxiety,” Storm said. Solar, which is his cosplayer name, dressed as a Sith Lord from Star Wars. We spoke in the now-empty Windsor Rose room, where earlier in the day, artists displayed comic-book artwork on easels and booklets on top of eight-foot tables, in hopes to commission their work or sell their art pieces. 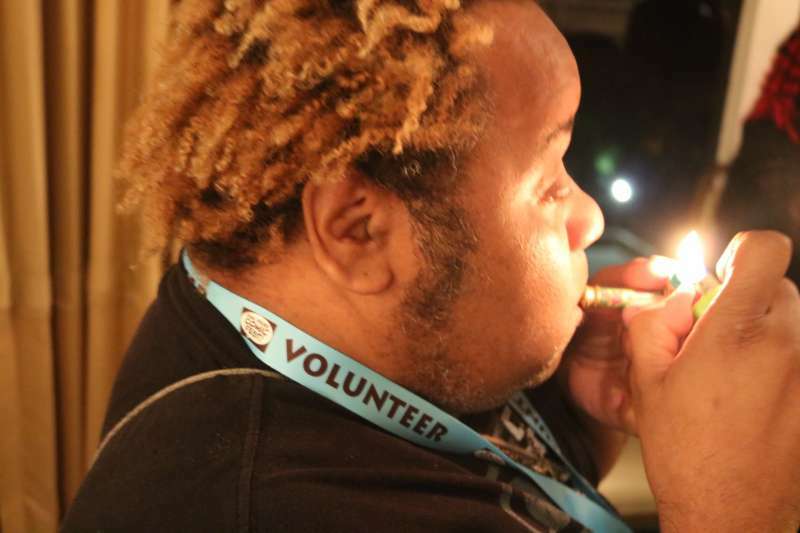 “No, I don’t smoke,” said Lee, a Chula Vista-based artist. He was the last one to close up shop by the Transylvania inspired castle-brick-decor. His original art was selling for $10,000, and prints were at $10 apiece. On the opposite side from where we interviewed, is the Le Chanticleer Room, or for this special night, the Frankenstein Cafe. The lounge faces the 805 and 8 freeways, and for this occasion, it was packed with art displays, steampunk concoctions, and live musicians. 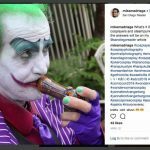 There were about 50 attendees that consisted of vendors, comic-fans, artists and customers — that got their drink on. In front of the fully stocked bar was a three-foot cake to celebrate Frankenstein’s 200th birthday. Many here networked and spoke of their transition to the 2018 comic-book industry, but our little group, kept it old-school. 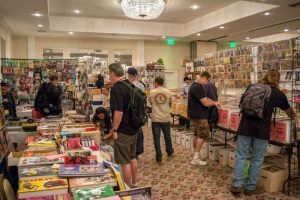 “This show here reminds me of the El Cortez comic shows,” Storm said, “with the comic and toy dealers in the various rooms spread out. 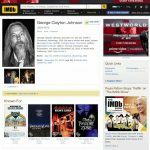 “Back then we called it ‘Alf-weed,’” said Aeion Solar, 52, an artist and a classically trained actor. 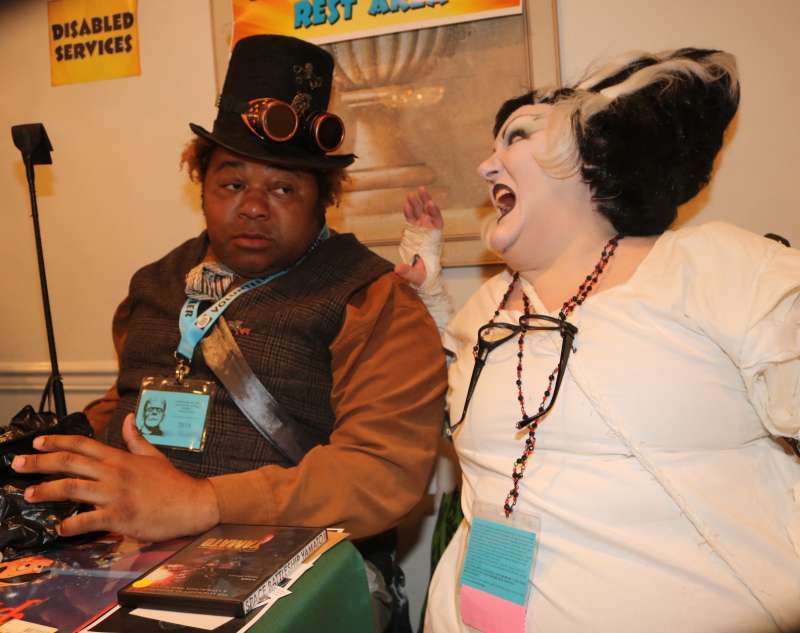 Solar, which is his cosplayer name, dressed as a Sith Lord from Star Wars, and was the official disabled service coordinator for the Comic Fest. Ray, another Comic Fest staff member, joined our discussion, which cued Storm to hide the weed in her Yoda backpack. Storm topped off her pipe with a different type of indica weed, called Deathstar. When Ray took off, Storm reached back into her Yoda backpack again. She topped off her pipe with a different type of indica weed, called Deathstar. When Storm gets high, she reads the Sandman and Death titles from the DC/Vertigo comic book line. “We use to get high at the 24-hour movie rooms at the convention center (Comic Con International),” Solar said, “and slept there.